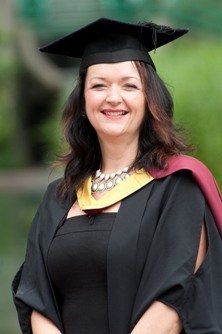 Stansted Mum beats the odds to graduate from University. A mum from Stansted was among over 1500 students from City University London to graduate at ceremonies held in the capital this week. Michelle Shields (nee Dodwell) completed a Bachelor of Science in Primary Care (Practice Nursing) with flying colours, despite balancing her study with working setting up a construction camp in outback Australia. Michelle, who was born and raised in Stansted and still lives in Burton End has over 25 years experience working in nursing and midwifery and is currently based in and around North London. "I was lucky to be accepted to undertake a pilot course for a unique collaboration between Tower Hamlets Primary Care Trust and City University London, called Open Doors, which allows Registered Nurses with no previous Primary Care experience to become competent, autonomous practitioners within the GP setting. With the support of Open Doors and City University I decided I would go on to complete a two year Degree programme in this area." "It was a life changing opportunity and one I simply couldn't turn down. I rang my lecturer to tell her I would have to drop out of the programme but she was determined that I not give up on gaining my degree. Between us we determined a way that I could submit my final assessment whilst working on the other side of the world. "Living in Australia was an amazing experience, but very hard work. I literally took my 16,000 word portfolio with me to the Kimberleys, a really remote part of Australia and worked on it there in order to gain my Bachelor of Science. All my books, documents and laptop were packed into 2 suitcases which travelled around with me as my husband and I were flown from one remote area to another - they would have travelled thousands of miles. I was thrilled when I ended up graduating with a First." "I'm now working for a private healthcare organisation training potential Practice Nurses. I'm also working in several GP clinics and putting my training to good use. I'm really glad my lecturer pushed me to finish my course - I have a lot to thank her for. Overall I was really impressed with the level of professionalism and flexibility within those who lecture and teach at City University London. I consider myself to be an advocate of their excellent teaching skills and continue to recommend the course to others," says Michelle.